You are here: Home / Fence School / Do I need a survey to put up a fence? Maybe not! Possibly one has already been done! Take a look in your house files. And/or check with your County Deeds office, to see if they have a survey on record for your property. 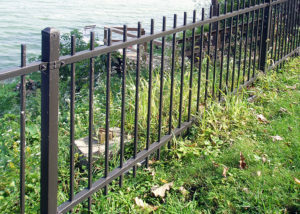 Hopefully, your property boundaries are marked by iron stakes in the ground. Unfortunately, these stakes may have been buried deep by bulldozers. Maybe vandals or malicious neighbors have removed the stakes! A surveyor informed us that he sometimes finds property stakes placed in locations which make no sense. In other words, you can’t really assume that the stakes you find in your yard are correctly placed. So maybe you will need to have a survey done. This is especially true if your property is not a true rectangle, with diagonal or jagged lines. What does a plat survey look like? A survey document usually includes a detailed drawing of your property, with measurements and other data. In Dane County, Wisconsin, you can see all the properties on your block, with dimensions included. That’s a start, but it’s not a survey, so keep looking. Once you have your property’s dimensions, our salesperson can help you find the all-important steel demarcation stakes in the ground. Using the survey measurements and with the aid of a metal detector a, we can often locate the stakes. However, metal detectors are useless when a big green utility box or your neighbor’s fence is nearby. .
What might the cost be? Our surveyor friends suggest $800 – $1,500. If you’d like a list of “our surveyor friends,” just ask as we can recommend a number o local companies.